BGR-Kentucky High School Sports - BlueGrassRivals » Off Topic » Conspiracy Discussion » Bigfoot Sighting? 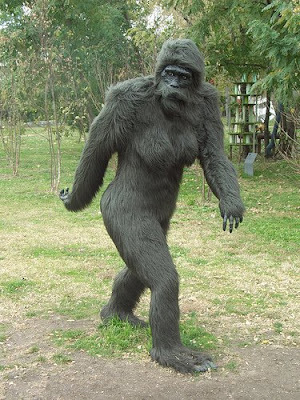 Rate This Thread - Bigfoot Sighting?. Apparently this video is making the rounds...I personally do not think this is anything close to an animal. Very much appears to be a guy in a Carhartt coat. I was on my back deck grilling out late one night last summer. I guess he smelled my steak or something, but a Bigfoot came wondering in. I don't know if it was were I was hungry or in a bad mood, but the next thing I know I was on top of him raining blow down on top of him. I ended up feeling guilty so I helped him up and dusted his coat off. I ended up giving him my steak. He took it and limped up into the woods. I still feel guilty over it because I beat him within an inch of his life. I promise you this lie is true. That's not Bigfoot, it is RIUTG's girlfrend! Location: "In the deep dark hills....."
You guys better stop messing with Sasquatch!! Not on my side of the family!!! I actually think it favors judgmentday!! I would bet NONE of BGR's wives even post on here; otherwise, this crap wouldn't be said! Mine calls this site the "bluegrass sports thingy"
My wife was really pleased with Kings beach model sig last week, I got...." sports forum site, sure honey, call it what you want ! " Bigfoot, amongst other potential creatures, has popped up on the radar near Cave Run Lake. There are some dandy stories here!!! All times are GMT -9. The time now is 03:34 PM.